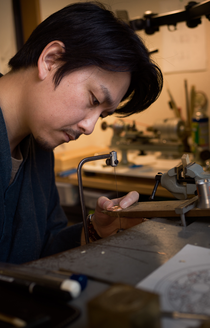 WELCOME TO THE HOMEPAGE OF MASAHIRO KIKUNO HANDMADE WATCHES. The only thing equal to everyone is "time". We are all given 24 hours a day, as long as we live, but it IS limited. This is the universal truth, that never changes from the past to the future. Therefore, we all have limit in what we can do in one day, and we can thrive and achieve something only in one's life time. The watches made in the past by the watchmakers with their limited "time" still "live" today and those watches do convey their passion to us. By "making watches with own two hands", watchmakers in the past, present and the future can feel the same "time". I would like to make watches that would surprise the past watchmakers, made with my own hands, brain, and tools, i.e. on an equal footing. And, the watch will be hopefully a message to the future watchmakers, having passed through your hand. He says, as most people including me, to create a watch oneself, we had to provide a lot of special tools and expensive automatic machines. And mostly, the funds to Possessing none of these means, he thought that it was impossible to make the watch. a Japanese old clock-making masterpiece, the myriad year clock. He was surprised to see the wheel that the watchmaker in old Japan had made up only of files in that program. Until that day, he believed that wheels should be made with machine-tool and CNC machine. He should have noted the evidence: in those days these watchmakers had possessed neither computer nor CNC machine ! He felt that these wheels have been cut out with the firm and passionate volition of craftsmen, who tried to achieve a work of quality. as this watchmaker before me, I can make parts from my hand. And I can make the watch from parts of my belief ” prepare those circumstances were most essential. This is how his conviction has been made.